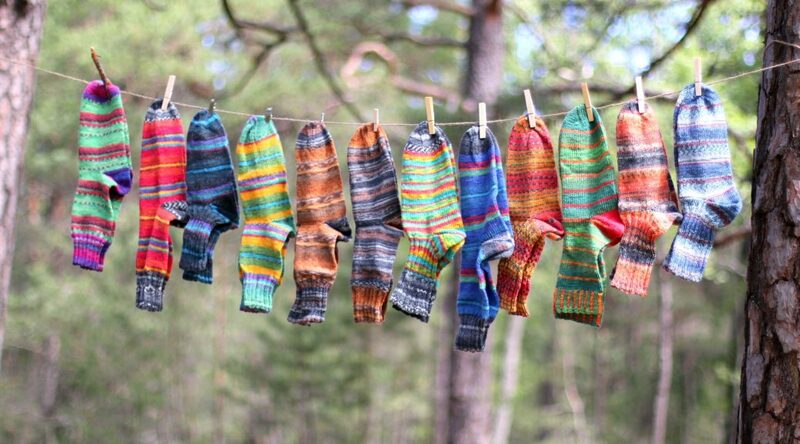 Bergfest (das) [German] : A celebration for managing to get half way through your biggest task (like masters thesis, house chores or knitting for Operation Sockdrawer). When you realize that the days are already getting shorter (well, not here, not really, we still have close to 24 hours of daylight up here – but you know winter is closing in when Midsummar is over). 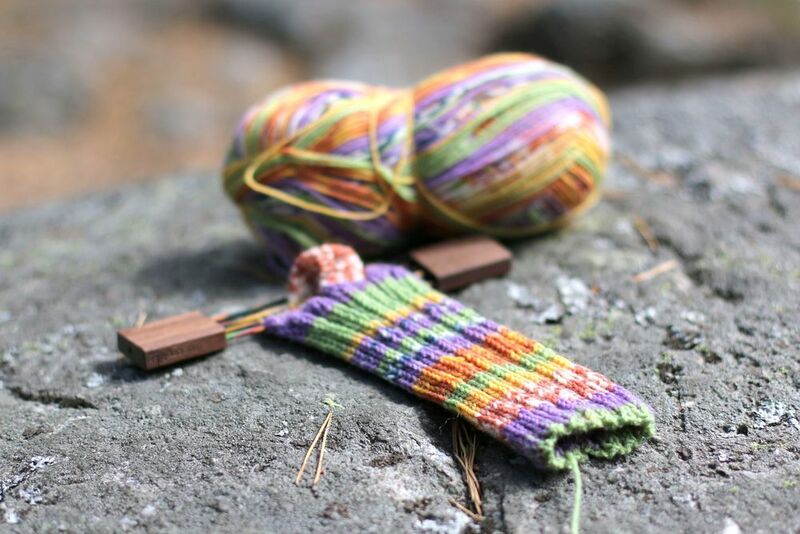 That also means that you are left with only 5 more months to complete this year’s top challenge: 24 pairs of socks in size 47 for my husband’s advent calendar. But first: Celebrate your Bergfest! Hooray for long train rides and cozy evenings on the couch. And thank goodness for binge-worthy tv-series! But I guess I’ll need a bigger one now, since this one doesn’t fit them all anymore… So, where to find a nice big box that I can hide in plain sight?? knitting while sitting next to him and binge-ing tv-series. Well. 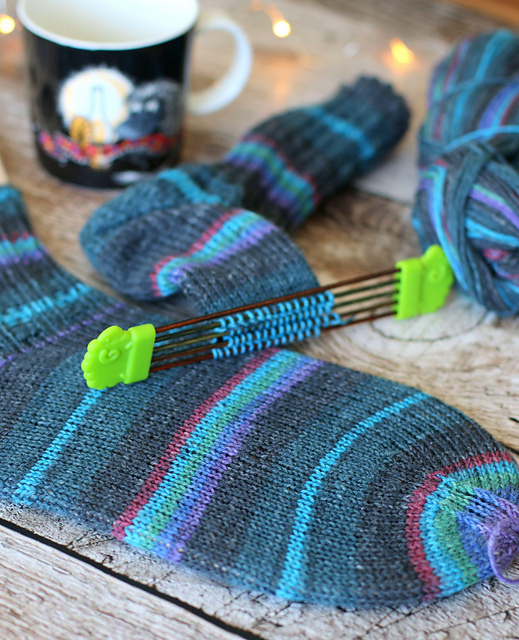 Good thing that I am a constand knitter where there’s ALWAYS something on my needles when I’m sitting on the couch and even better that he usually doesn’t look twice at my projects, or he would realize that MY supposed socks are getting way too long for my feet. Luckily I am a size 44, so he won’t notice if they are a liiiittle longer. 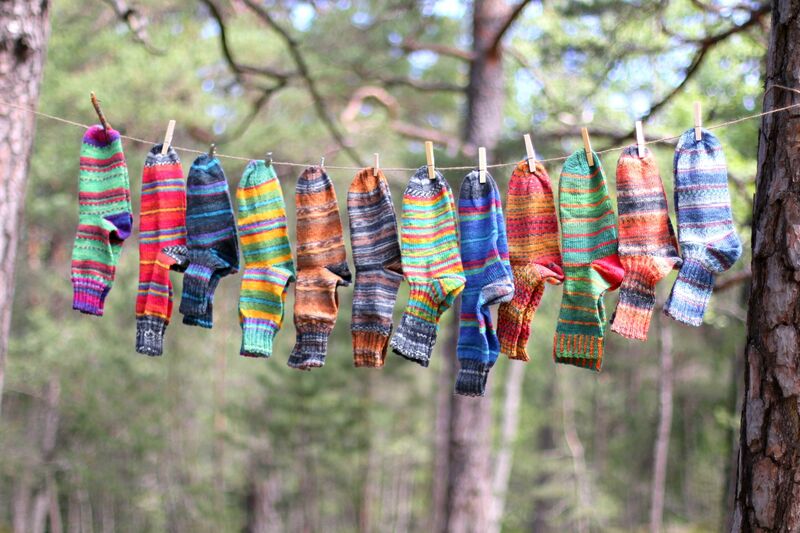 Hooray for male knittingnorance 🙂 I wonder if he gives it any second thought at all, seeing all the socks… Hmmm. who knows what’s going on in his brain anyway. Finding appropriate (read: male compatible) patterns that won’t bore me to death and that will suit him, too. He usually is really picky. Therefore Lucky Me has the choice of standard k2 p2 ribbing or the spiralling socks that you saw here ( k3, p3 for three rounds, then move the whole k3 p3 one stitch to the left… Not really an interesting knit but apparently it keeps its shape very well). 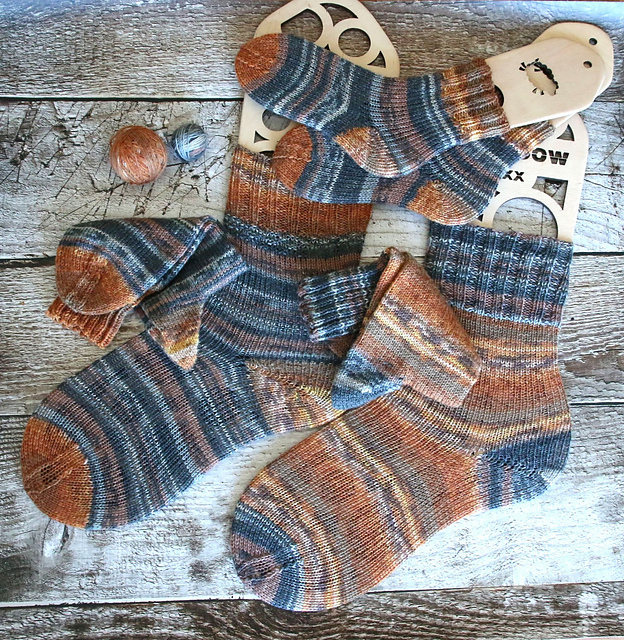 I’m already on the hunt for patterns that will relieve me from knitting plain vanilla socks all the time. 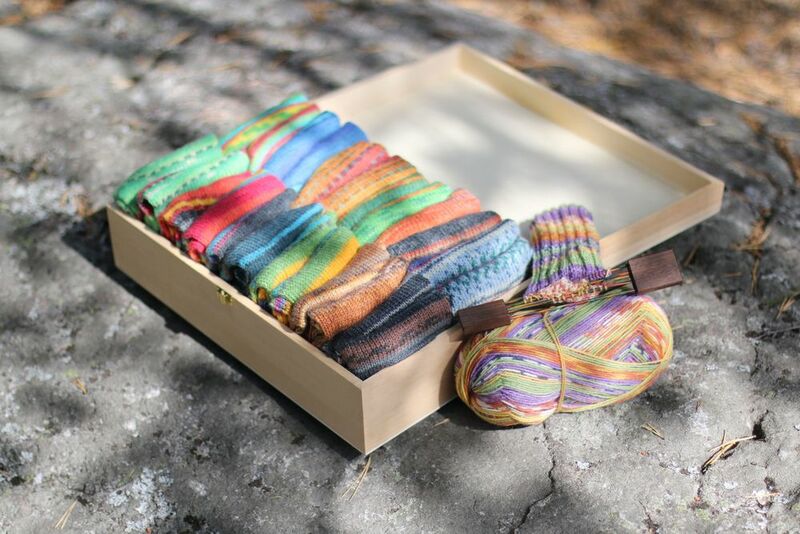 But so far the lovely Opal yarns I am working with (see my brandnew box of yarns here) are a pure joy even on plain vanilla socks so I’ll have my fingers crossed that he won’t complain about this huge box of socks full of colours. 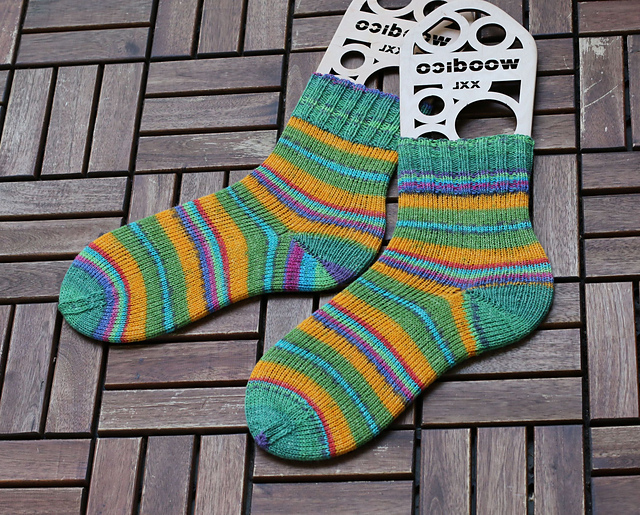 Here they are, 12 pairs size 47, knit with love, sweat, Opal yarns and needles (3mm). 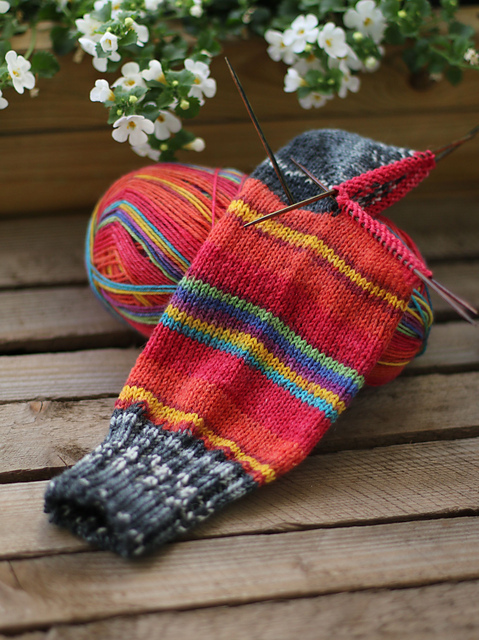 You can see more pictures of the socks in progress on Instagram #24pairsofsocks and here on Ravelry. These yarns will be available soon! Regenwald 14: July 3rd 2018, Sinfonie der Träume: July 18 2018, Handwerk & Hobby: August 30 2018. I’m excited to start knitting with the new editions (Little Secrets 6ply, Opal Schafpate X and Winterspiele XXL (8ply)) now! Now I’m off to hide my box of socks again before someone decides to take a peek anyway. So Beautiful!! I love all of the colors and the box! 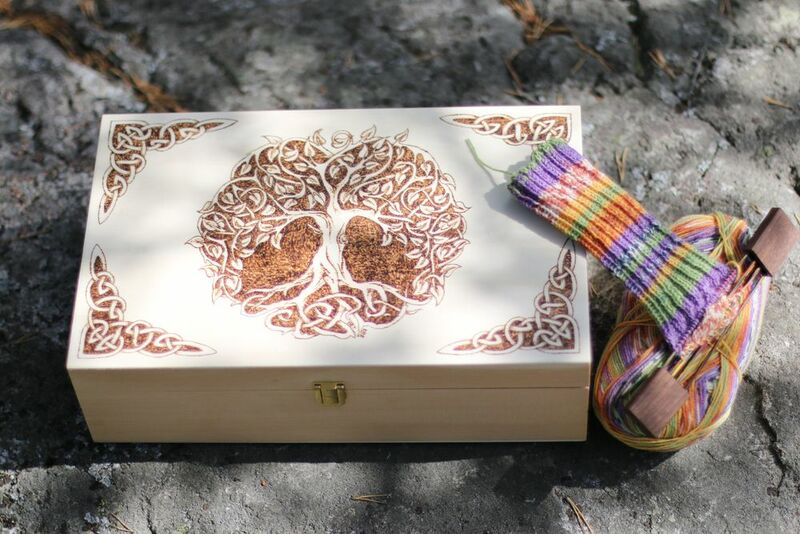 Where can I purchase the wooden needle holders? Thank you! I have my to-go-to pattern written up here, you can swap out parts as you like. Happy knitting!